On January 10, 2018, Misao Jo sensei passed away peacefully. She was 104, with her 105th birthday just a few months away. Misao has inspired so many through the SAORI philosophy and her passion for it. At 57 she embarked on a journey that will carry on through her family and so many others. I had the great honour to meet her in Japan many times on my trips. 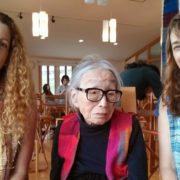 I will think of her as I weave and share SAORI and do my best to help others know the joy of this beautiful philosophy. Love, prayers and blessings to her family. She will be greatly missed. Two weeks in Japan! Two weeks of SAORI inspiration! Two weeks with my friend Laura (of SAORI Studio LA)! What a wonderful time I had. I have been trying for 4 years to get back to Japan and I finally made it. So much fun, so much SAORI – but I wish I could have stayed longer! Imagine – an anniversary party for SAORI no Mori with over 100 people attending – all wearing SAORI. Wow. 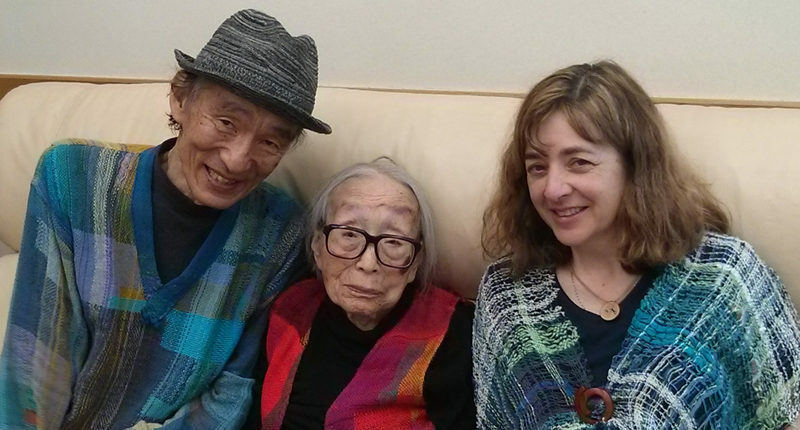 Seeing Misao Jo again – now at 101 years old and many of the Jo families – generations of SAORI weavers. Also meeting other weavers and staff at the studio – all such wonderful, warm and fun people! 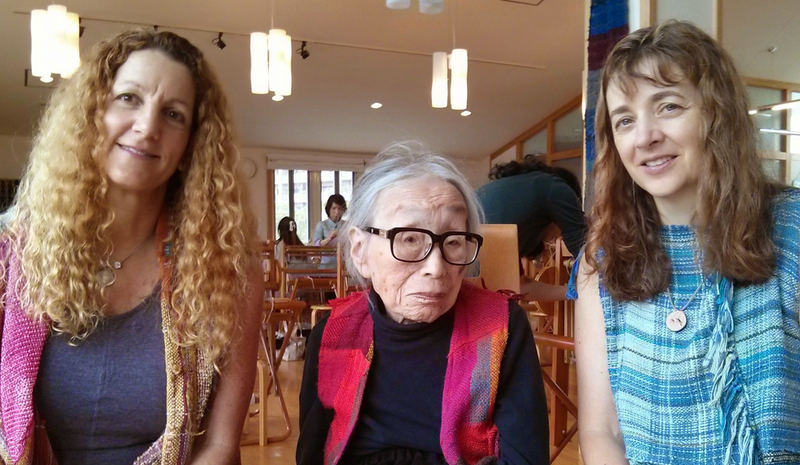 Learning more about SAORI, weaving, a clothing design class with the master clothing designer Masako and more. I’ve been posting lots of photos on Instagram and Facebook and have neglected the blog. Apologies! The Blossom Banner created at the Blossom Festival and finished at the studio has headed off to Hiroshima for SAORI Peace Weave 2014. I’m now back at home, at my studio and looking forward to a SAORI Kai, SAORI workshops, classes and retreats including the Loom Dancer Weaving Odyssey retreat here in July with 10 people! I’ll be writing more often – see you soon. The first one is a banner that was made by many weavers on Salt Spring Island. It was donated to the SAORI Bridges of Elm Park project in Worcester, MA. The vision of Nat & Mihoko of SAORI Worcester to drape the bridges in the park with beautiful woven banners with the proceeds to support long-term low-income Worcester Public School young artists as part of a SAORI weaving program. The second banner, is a banner called “Threads of Hope & Healing” that went to Hiroshima, Japan as part of SAORI Peace Weave 2012 (see more on my blog thread here) and then travelled to the 2012 International SAORI Weaving conference hosted by SAORI Studio LA. …the colours of the chakras woven with thoughts of hope and healing and with local alpaca yarn. Last week, Darn Good Yarn asked me to do a guest blog for their site and they featured my weaving that I did for SAORI Peace Weave 2012. You can read the post and see some photos here. This year the SAORI Peace Weave 2012 exhibit will be from July 14 – 17 at the Former Bank of Japan, Hiroshima Branch (Fukoro-machi, Naka-ku, Hiroshima). I was so happy to be able to send something to contribute to this annual event. This year’s theme is “walk / go forward” for peace. The title is ‘KISSAKO’ which is a welcoming word with a few different interpretations, but basically ‘welcoming people with love’. Tara says she was delighted to make this offering for Peace and greatly appreciates the ‘goodness’ in the Japanese Saori community. It is beautiful – I love the colours and the way that the red is so striking against the other colours and yarns! All of the yarn is made from recycled and Earth friendly materials and much of it is created from the colorful remnants of the production of silk saris in Nepal and Northern India. These materials are handspun and dyed by women’s groups in Nepal. Darn Good Yarn provides these women with a marketplace for the products, as well as much needed wages for their families. I think that these are some steps forward to peace. I have been weaving for peace every year since 2006 and usually as a community collaborative weaving. Unable to do that earlier this year, I decided to use the colours of the chakras and chose pieces of the ribbon to go with them. This is part of my personal “walk forward” and related to some of the meditation and energy work that I am doing for my own healing. When I finished the weaving I wanted a picture of it, so Alan and I headed out in the car to find a location to take the photograph. We didn’t go far – just down the road to our neighbour’s farm – North End Farm. (This is where we get delicious eggs, strawberries, tomatoes and other local produce). This past weekend was an art event called “Gorge on Art” – set on the beautiful Gorge Waterway in Victoria, BC. There were many types of art there including paintings, jewelry, pottery, metal work and SAORI Weaving! Lynn (and Bob and Alan) helped with the set up of the tent and booth at the festival. Of course we brought a SAORI loom to invite people to weave a scarf for the Omoi no Katachi (Thinking of You) project (see more information on a previous post here). This scarf will be sent to Japan as part of weaving “10,000 scarves” to help the communities affected by the earthquake and tsunami. Many people enjoyed the weaving…. I love watching kids weave, they are so uninhibited. I marvel at adults that say I can’t and then do! and discover how much fun it is. I love it when they ask if they can feel the weavings and are delighted with the experience. The couple that wove so differently was interesting…so opposite, yet able to laugh at each other. I am amazed at how quickly the time went and how much fun it is to engage with people who are interested, have such positive energy, discover something new about themselves. I am amazed at myself, that I can be a part of something so incredible, creative, satisfying after having such a different previous life! I think that really sums it up. I love being in the community with SAORI! Many weavers – all different styles! 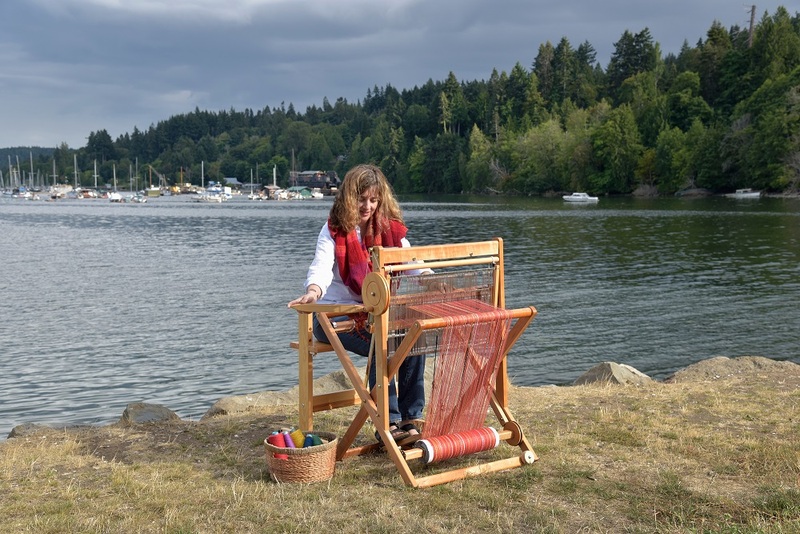 Back in January, Karen Lohn contacted me to ask permission to use some photos of SAORI weaving for a book that she was working on called “Peace Fibres – Stitching a Soulful World“. There is great yearning for a world community of peace. There is yearning for personal peace as well. What if simple fibres offer a great unifying avenue for developing harmonious relationship to self, to others, and to the larger world community and all of its inhabitants? The pages … offer images of fibre creations from six continents, verification of our commonality as human beings and our interdependence with the natural world. For more information please see Karen Lohn’s website at www.peacefibres.com. Back in April at the Blossom Festival on Salt Spring Island, I invited people to weave a “Blossom Banner” to send to the people of Japan as a message of hope for their recovery from the earthquake and tsunami. When I went to Hawaii later in April, I met with Kenzo and Naoto Jo of SAORI No Mori and presented the Blossom Banner to them to take back to Japan. Sendai was the place that we kept hearing about in the news from Japan after the earthquake and tsunami. I also had a connection to Sendai as I had sent a Peace Banner there in the past for SAORI Peace Weave 2008. When the banner arrived in Japan, Akiko Jo asked me if it would be alright if the banner went to some other SAORI studios before finally going to Sendai. She told me about one of the SAORI studios in a smaller centre, Ishinomaki (see note below), that had been devastated by the tsunami. Of course, it would be totally fine with me – and all those who wove it too I’m sure. The intention in the weaving of the banner was to bring hope and good wishes for recovery to the people in Japan – so wherever that may be needed was certainly a good thing and I felt very honoured. Akiko translated the posts about the banner from my blog into Japanese and Kenzo took the banner to the grand re-opening of the studio. 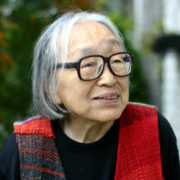 The owner of the studio is Ms. Emiko Oikawa. The name of her studio is SAORI Weaving Studio “Yokisha”. “Yokisha” is made of three Kanji (Chinese) characters, and each character means “give”, “joy” and “building”. So they mean that “the studio gives joy to the visitors”. 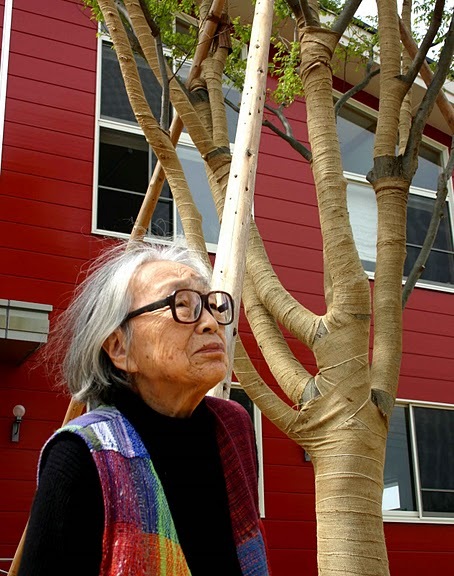 Ms. Oikawa is so energetic to re-open her studio only 3 months after the disaster. As you can see on some of the photos, the streets of her neighborhood are still filled with the remaining wreckage, including some boats. The wreckage carried around by the Tsunami reached the height of the traffic lights, and damaged them. the kind thoughts brought with the banner all the way from Canada. This is a weaving done by Kenzo Jo and his colleagues at Saori no Mori in Osaka, Japan also for the opening. They did double-cloth weaving on both looms, so the width of this tapestry is 240cm (four times 60cm). Now the banner will travel to other studios before going to Sendai. 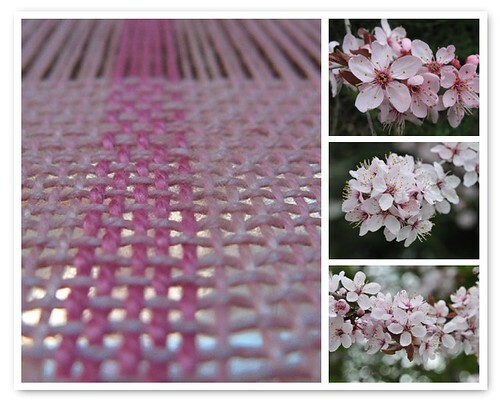 Thank you to all the weavers who participated in weaving the Blossom Banner – it now continues on it’s relay through Japan! The city was among the most seriously affected by the 2011 Tōhoku earthquake and tsunami.] A tsunami about 10 meters high traveled 600 meters inland and destroyed around 80% of the 700 houses in the coastal whaling port of Ayukawa and district of Kadonowaki. Approximately 46% of the city was inundated by the tsunami. One elementary school, Okawa Elementary, was completely destroyed, killing 74 of 108 students and 10 of 13 teachers and staff. As of 17 June 2011 a total of 3,097 deaths had been confirmed in Ishinomaki due to the tsunami, with 2,770 unaccounted for. The earthquake shifted the city southeast and downward, lowering it by as much as 1.2 m in some areas and causing it to flood twice daily at high tide. So many people sending their thoughts and prayers with this banner to Sendai, Japan. It heads out tomorrow – going to the Sendai Saori Studio. Thank you to everyone who helped make this possible and to everyone who contributed through their weaving, their help, their blossoms and their blessings. What a fabulous weekend! We went to the Blossom Festival picnic in the Japanese Garden Peace Park on Saturday. The weather was great and many people attended. We were entertained by a Japanese flute player (Takeo Yamashiro), Haiku Readings by elehna de sousa, Raffi singing with a Japanese back-up group, origami, food, an art installation by Shannon Wardroper and other entertainment (Jean-Paul Maurice, son of my friends Jim & Chris from Rawsome Living Foods and others). There were many tents with people selling things – the proceeds all to a fund for Tsunami relief for Japan. There are more details on the program on my previous post. Then today was an indoor festival with an Ikebana flower arranger, a Japanese landscape architect, a Taste of Salt Spring (many local chefs and yummy food) and of course, Saori weaving! I also had people write or draw on some cloth blossoms that I will be attaching to the banner before I send it. I will make sure to get some photos of the completed banner. What a beautiful way to spend a Sunday afternoon. Thanks to the organizers of the Festival, to Laura & Jane for assisting with the Saori weaving and to everyone for stopping by and adding some threads and thoughts to the banner (and for those that wanted to but couldn’t – your thoughts and prayers are included in the banner too). I have been wanting to go to Japan during Cherry Blossom season ever since I started Saori Weaving and made my first trip there. Last year I missed it by a couple of weeks. This year it is my prayers that I’m sending to Japan. However, this weekend there is a Blossom Festival on Salt Spring Island!! How cool is that?? So, I’m going to participate and take my Saori loom with a ‘blossom’ warp on it and take a basketful of blossom-y yarns and invite people to weave. The banner, when completed, will be sent to Japan as I see it as a sign of new growth, rebuilding, collaboration and hope. This will happen on Sunday, April 10 at the Harbour House Hotel in Ganges on Salt Spring Island from Noon – 5pm. There are many other events happening too. Here is a pdf of the festival events. If you are able, please come by and add some threads of hope and spring to the banner.